The NFPA classifies ethanol as a Class IB flammable liquid. Handle and store ethanol with great care. Ethanol usage as a biofuel additive for fuel has rapidly grown since the early 2000s. Trains transport large volumes of it across the country. Some of the biggest safety and environmental incidents involving ethanol occurred on the railways, according to the Massachusetts Department of Environmental Protection. Other notable incidents include explosions and fires at distilleries in their storage facilities. Unlike oil fires, ethanol fires do not produce thick black smoke. Firefighters call them “invisible fires.” The heat zone reaches far beyond the visible flames. These fires are very difficult to extinguish. In derailment incidents, they are generally allowed to burn out. What Are the Applications for Ethanol? Ethanol is a clear and colorless liquid with many commercial and industrial applications. The pharmaceutical industry uses ethanol as a solvent and preservative in the manufacturing of drugs. It is also the primary ingredient in making alcoholic beverages. Other uses include the manufacturing of scents, flavorings and coloring. As mentioned above, ethanol is used as a biofuel additive for gasoline. The United States is the largest producer of ethanol fuel in the world. Typical gasoline blends may contain up to 10 percent ethanol. This percentage is trending up – 15 percent blends are becoming more commonplace. Ethanol has specific storage requirements due to its properties and associated hazards. Pure ethanol has a flashpoint of 55 F (13 C). It releases vapors into the atmosphere, creating a flammable environment. Temperature controlled chemical storage buildings will prevent excess evaporation. Ethanol also tends to absorb water from the surrounding environment. Store in dry areas, with low humidity. It will absorb any condensation that forms inside storage vessels. OSHA sets requirements for the storage of flammable liquids. The closer the storage area is to an occupied building, the more stringent the regulations. For instance, a 4-hour fire rated building must be used if storing ethanol at a distance of 10 feet or less from an occupied building. Use a 2-hour fire rated building when storing anywhere from 10 feet up to 30 feet away. Use non fire-rated chemical storage buildings when located 30 feet or more away from an occupied building. 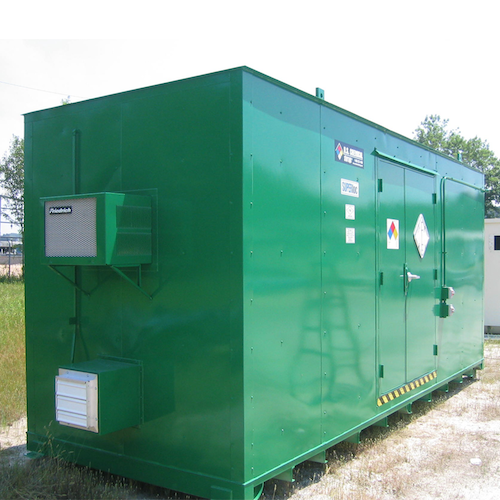 U.S. Chemical Storage supplies fire-rated and non fire-rated chemical storage buildings. All prefabricated buildings feature built-in secondary containment sumps. Continuously welded steel sheets give the sump its strength and leak-tight performance. Our chemical storage buildings offer optional accessories ideal for safe ethanol storage. Climate control systems regulate the temperature within the specific range required for ethanol and prevent the buildup of excessive condensation. Use exhaust fans to remove flammable vapors. Automatic dry chemical or water sprinkler fire suppression systems limit the spread of fires. This is vital since the fuel must burn out in ethanol fires. All electrical equipment included in ethanol storage buildings is intrinsically safe to prevent sparks. U.S. Chemical Storage provides technical advice and custom solutions to help safely store ethanol. We ensure safety and compliance to code. Contact us to learn more about our storage solutions or to receive a complimentary quote. Browse our product range here.